Are you into hiking and outdoor activities in South America, but you don’t know where to start planning? Than this one is for you! Choosing the right trek really depends on a wide variety of factors. How much time you have? How experienced are you? How much are you effected by altitude? Read on and learn all about it. Patagonia, with its blue lakes and snow capped mountains the perfect place for your outdoor adventure. Photo credit: Shutterstock. The two most popular trekking areas in South America are undoubtedly Patagonia and the Peruvian Andes and so I’ll cover these options first. Trekking in Patagonia or Peru? Patagonia is the place for hiking and outdoor activities in South America. 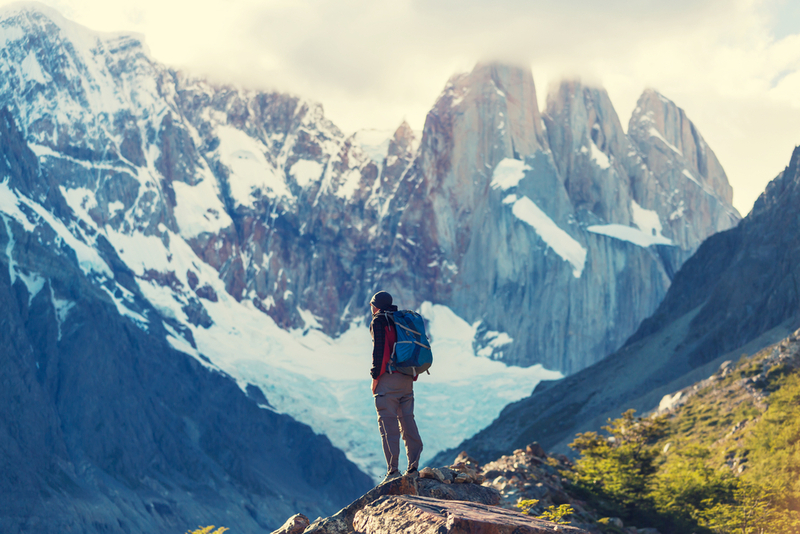 You’ll need to trek in Patagonia between October and April. The Peruvian Andes is best between May and September, as almost diametrically opposing seasons. This can work well if you want to do both regions provided you’re willing to travel in September/ October or April/ May. April/ May would be my pick as you get the autumn colours of Patagonia in April and locations like the Inca Trail are at their best in May as the trail is closed for all of March for its annual clean up so is generally pretty clean and not as worn out as it can be later in the year. In both regions there is a lot of diversity. 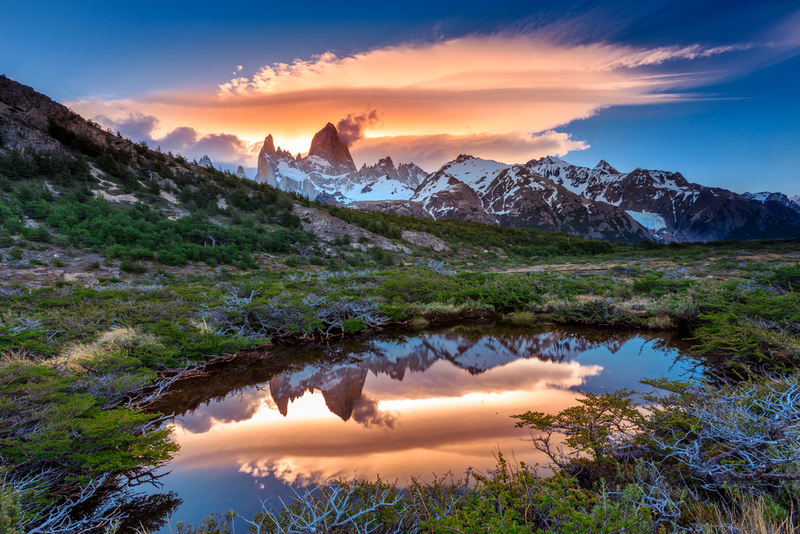 In Patagonia the most popular region is probably Chile’s Torres del Paine, but it’s also the most expensive. Its dramatic granite towers truly are stunning but there are lots of other options in the region. A cheaper alternative to Torres del Paine is El Chalten, in Argentina. Mount Fitzroy near El Chalten even looks reasonably similar to Torres del Paine. 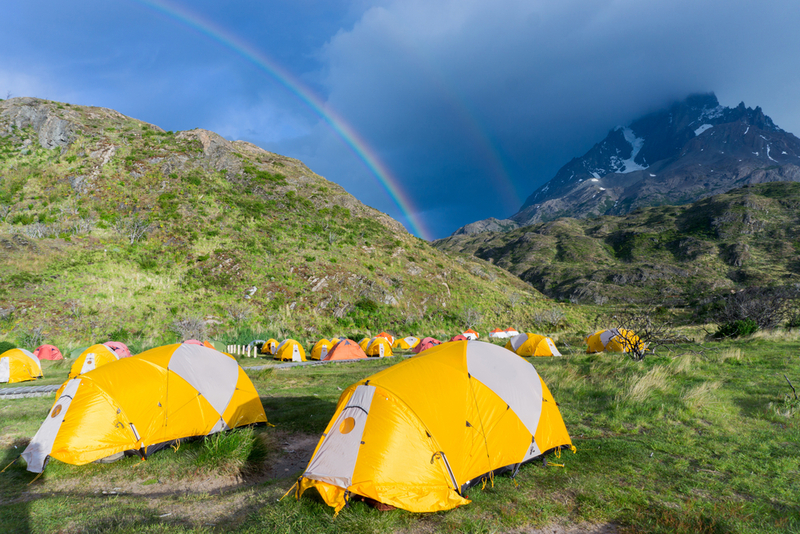 camping on the W trek in Torres del Paine National Park. Photo credit: Shutterstock. Another popular destination for hiking and outdoor activities in South America is Torres del Paine, with its the most popular hike, the W trek. This is a great trek but also quite long (5-7 days). The trek is basically the W made by the route between Lake Grey, around the Paine cones (the ones that have the black tips at the top), into the French Valley (then centre of the W) and then around to the actual towers (fingers) that give Torres (towers) del Paine its name. If you don’t want to do the full seven day hike there are a few options where you can just stay in a lodge at the edge of the W trail and then just to day hikes on portions of the W trek. Eco Camp and Hosteria Las Torres are the two most popular options we sell in this category. 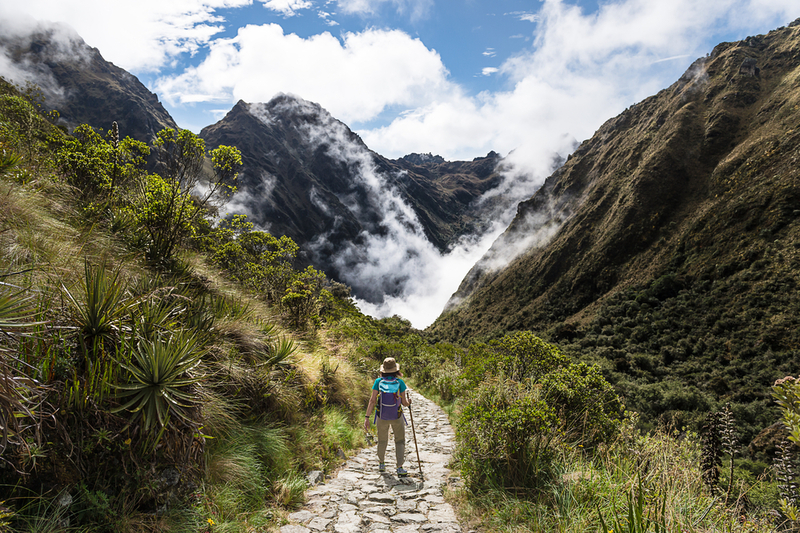 Hiking the Inca Trail. Photo credit: Shutterstock. In Peru there is a lot more than just the Inca Trail. The nearby Lares trek is an easier trek for those that are less mobile and it’s a fascinating trek through small, remote villages which you’d otherwise never get access to. On the other hand there are much more challenging hikes than the Inca Trail, such as Salkantay and Ancascocha which will are more suited to season trekkers who know their limits at high altitude. For those not wanting to rough it there are now lodge to lodge programs for both the Salkantay and Lares treks – which offer a great superior style trekking option of the area including great cuisine and hot tubs. Trekking in the mountains of Peru. Photo credit: Shutterstock. In Patagonia there are also treks in more off the beaten track places like far south Ushuaia (where the Antarctica Cruises depart from) have amazing National Parks and treks nearby. The north of Patagonia is also worth considering if you’re looking for a more temperate hike. The lake district of northern Patagonia is called the “Switzerland of the South” and the region has some of South America’s best ski resorts and golf courses. It also has some amazing lakes, forests and of course hiking areas. It doesn’t have the dramatic landscapes of Southern Patagonia but if does have lower average wind speeds and the climate is generally a lot gentler. 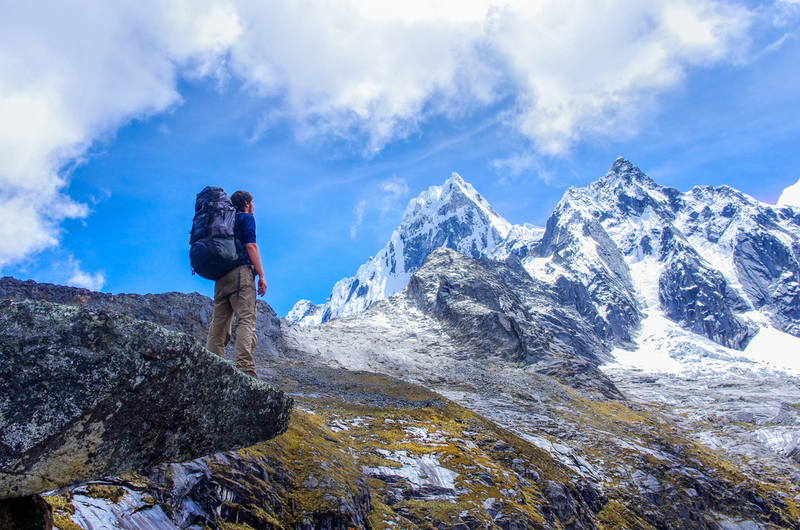 Another great place to consider trekking is the Huaraz or Cordillera Blanca region of northern Peru. This rarely visited region is actually the second highest mountain range in the world outside of the Himalayas. Obviously it’s popular with mountain climbers but there are also some fantastic, not so extreme treks in the area too. If you’re looking for options even more off the beaten track consider locations like the Lost City trek in Colombia, Trekking in Salta (Northern Argentina), trekking anywhere in Costa Rica or even a trek to Angel Falls in Venezuela. Chimu Adventures offers a great variety of trips and tours to South America. Click here for more information.